Tinderholt’s bill likely has no chance of ever becoming law, with even some anti-abortion activists and legislators raising opposition. The bill is so extreme that even abortion foes are worried that it wouldn’t pass muster before an increasingly conservative, anti-abortion Supreme Court. Republican state Representative Jeff Leach, who co-authored the 2017 version of the bill and leads the House committee that held Monday’s hearing, has no intentions of allowing the bill to pass out of committee. “I cannot and will not support nor will I let come out of this committee any bill on [abortion] which targets the woman with either civil or criminal liability,” Leach said, according to the Dallas Morning News. One group, the Texas Alliance for Life, opposes Tinderholt’s measure, saying the change would run afoul of the U.S. Supreme Court’s backing of abortions of nonviable fetuses. Also, the group notes, Texas didn’t prosecute a single woman for receiving an abortion in the century-plus before the high court legalized abortion nationally in 1973. 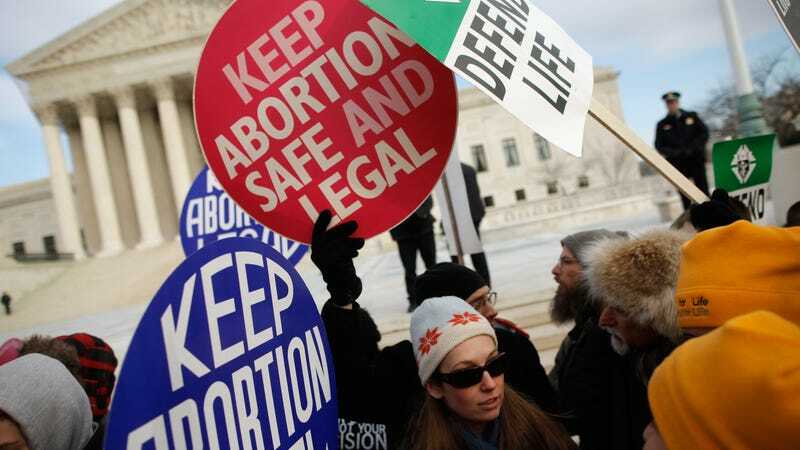 Another anti-abortion group, Texans for Life, “opposes criminalizing or penalizing women as it only protects the abortionist,” its president, Kyleen Wright, advised in an email. Elizabeth Graham of Texas Right to Life stopped short of endorsing the proposed ban, but otherwise said in an email that the group is working closely with Tinderholt. Still, at a hearing on the legislation on Monday, more than 350 people signed up to testify in support of the legislation. You would be reasonable to suspect that those in support of the bill would not actually agree that people who get abortions should face the death penalty, but you’d be wrong. Jim Baxa, the president of West Texans for Life, is fully behind the idea. “A woman who has committed murder should be charged with murder,” Baxa stated, according to the Washington Post. Others like Stephen Bratton, a pastor from Houston, echoed Baxa. “Whoever authorizes or commits murder is guilty,” Bratton said. Sonya Gonnella, a self-described “follower of the lord Jesus Christ,” quoted the Bible: “God’s word says, ‘He who sheds man’s blood, by man—the civil government—his blood will be shed.’” These are terrifying things to believe. They are also, in a movement that calls abortion murder but prefers to sidestep the question of what taking that claim seriously would really mean, incredibly honest and ideologically consistent. Meanwhile, opponents to the legislation like Caroline Caselli, a tech company CEO who recently moved from California and is surely regretting her decision despite the lower taxes in the state, raised some sensible objections. “Murdering your citizens for a medical procedure is pretty extreme to me,” Caselli said.